Objects of Common Interest, Marble Mirror, 2016. Solid Marble, Mirror Polished Copper. Photo by Brooke Holm. 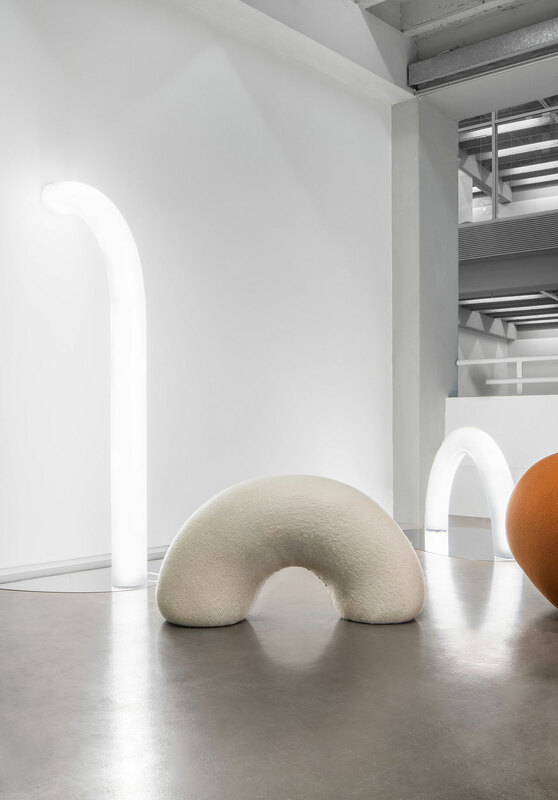 It would be unfair to label Objects of Common Interest simply as a design studio, since its founders, Eleni Petaloti and Leonidas Trampoukis, are mostly interested in the story before its incarnation, focusing on abstract shape before its material manifestation and light before its spatial dynamic. Architecture, objects, installations, ephemeral environments, and the exposure of their work to unexpected public behaviour, are the core interest of the couple who met as students and have evolved together, through architecture and design, always working on parallel projects that seem to continuously keep them both on their creative toes. 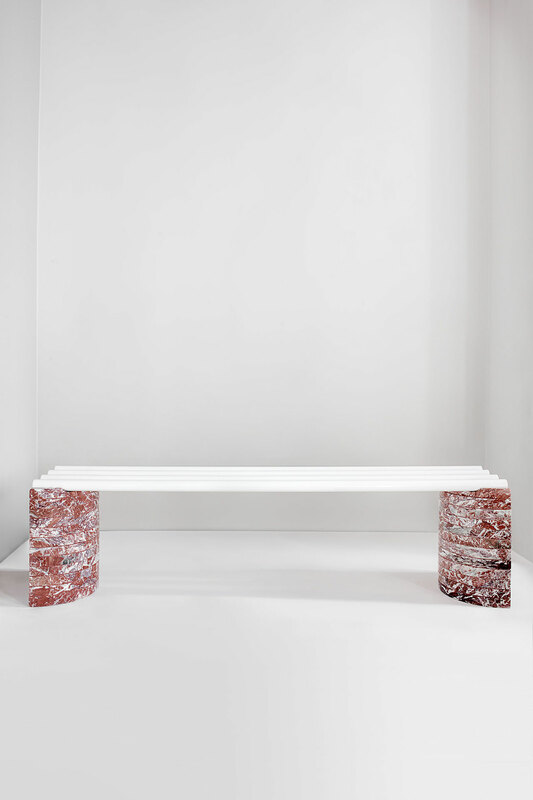 Objects of Common Interest was launched in 2015, while their architectural firm LOT had been around since 2012, with both having offices in Athens as well as New York. With their Greek heritage carved into their subconscious (in one of their projects they applied Euclidean geometry), the couple has also managed to blend the two diverse cultures they dwell in into a dual identity that endows their work with an excitingly creative dialogue. 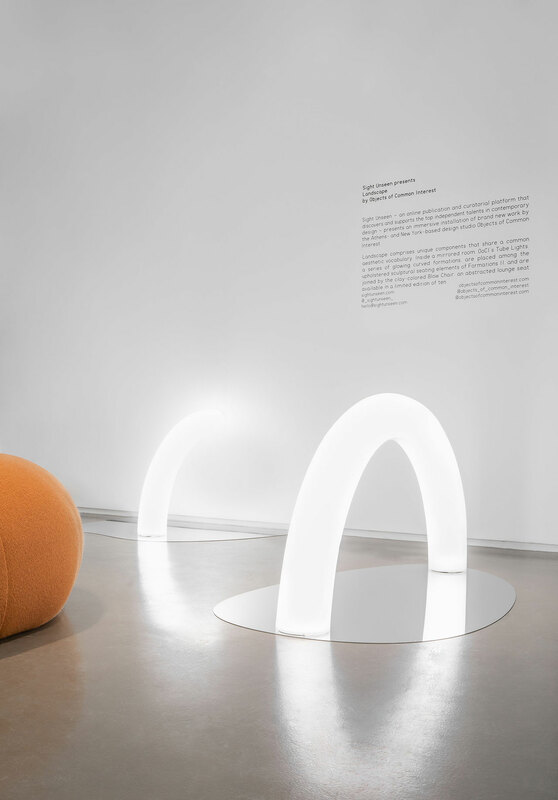 After an impressive body of work that includes, among others, the Flatiron Sky-Line, (a series of illuminated white steel arches temporarily installed on Manhattan’s Flatiron Plaza in 2016), Untitled, an installation of glass blocks with colourful laminates for the VIP lounge of Collective Design in New York, and the installation Formations for Art Athina 2018, they have now created a mirrored installation called Landscape for this year's Collectible Design Fair in Brussels (March 14-17, 2019). 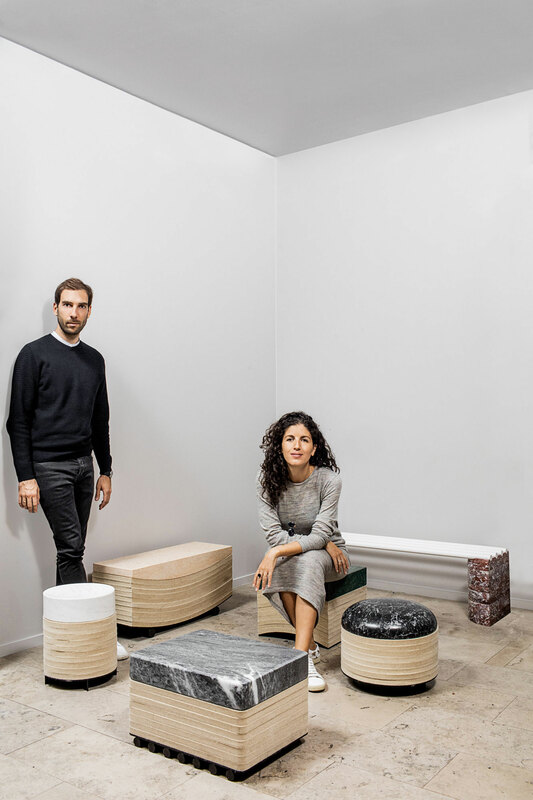 Yatzer recently caught up with Eleni and Leonidas to discuss their latest project, their creative relationship, and their design philosophy. Objects of Common Interest, Tube Lights, part of Landscape installation, 2019. Photo by Lauren Coleman. Objects of Common Interest, Landscape, 2019. Photo by Marco Arguello. LOT, Flatiron Sky-Line, 2016. Manhattan, New York. Photo by Brian W. Ferry. How did your partnership come about? In your creative relationship do you have distinct roles, in that one is the mind and the other the soul? We have been partners in life for a while. Without planning it, we have been following a similar direction, with architecture studies in Greece, Paris, and then New York. We both worked in architecture and Eleni also worked in the art world. Soon we found an expressional interest in objects and this in-between scale of installations, still life objects, and presentations that always have an architectural sensibility, as this is what we have in common. Our creative process begins with the two of us brainstorming together, mostly through conversation, but we do have separate roles later on during production or construction or while working with our collaborators, since we are occupied in multiple projects at the same time. Which is the principal feeling you wish to evoke with your work? We want to evoke feelings through personal perception and not to impose a direct concept or a reaction. This is one reason why we have been designing a lot of different projects, not creating similar variations from one work to the other, but each one starting from a completely new perspective, ideas triggered from our way of looking at things. Objects of Common Interest, Bent Stool, 2016. Marble. Relativity of Color glassware, 2017. Hand-blown Glass, Acrylic. Photo by Brooke Holm. 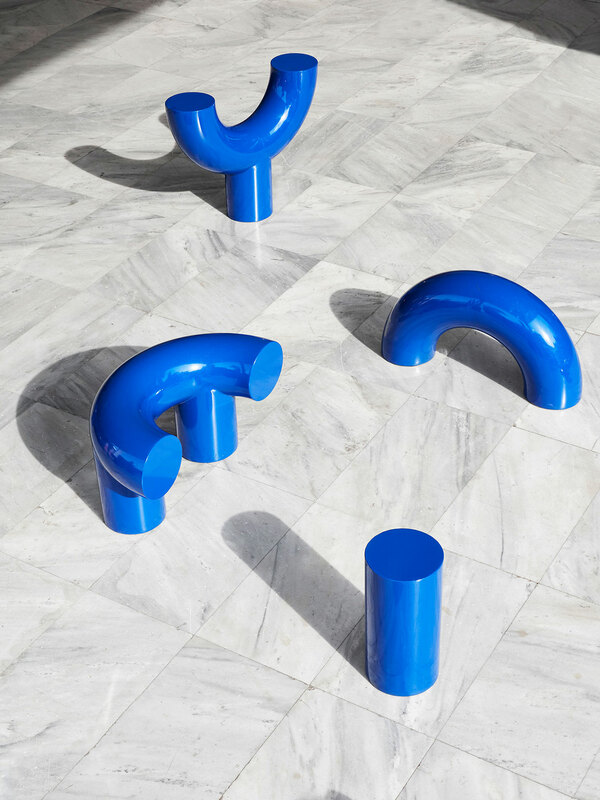 Objects of Common Interest, Tube Chair in collaboration with Falke Svatun, 2018. 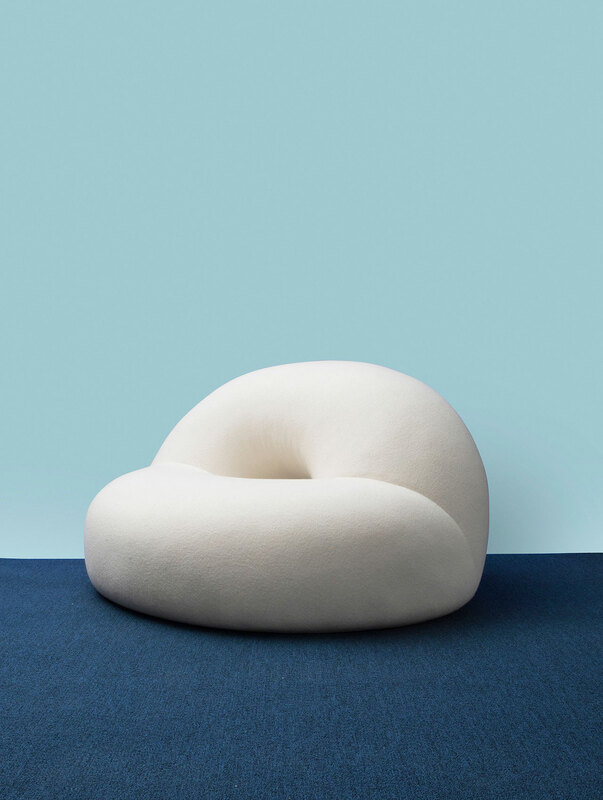 Chair Foam, Fabric. Photo by Charlie Schuck. 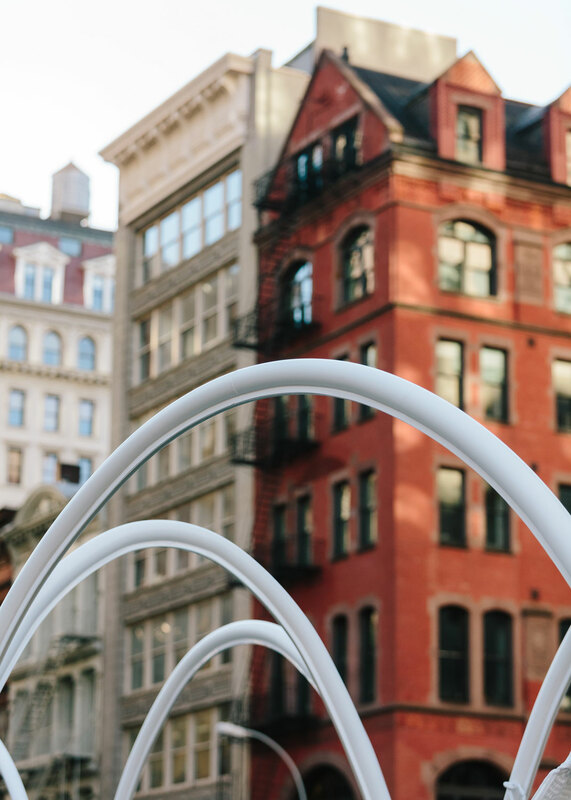 Working from both Athens and New York, what have you seen to be the creative dialogue between the two cities? There has been a great interest in Greece, in particular Athens and the islands, during the past two-three years. It’s not just a post-crisis affection but, from what we believe, it has to do with a creative spirit and extroversion that came from the Greek side and inspirationally reached and touched quite an interesting and important New York crowd, within the field of art and design; and vice versa of course. There has always been an interest in Greece but now it is a true creative interest and the press soon followed. Within this context there have been many initiatives to bridge the distance with collaborations, events, exchanges, publications and so on. We think we have also contributed in our own way, by blending the cultures in our work and initiatives to work both here and there and often talk about the importance of this back and forth from NY to Greece for the creative process we follow. Does an object of common interest always need to have a use, be that practical or not? We always assign a label, a role onto an object, but we always invite personal interpretation and it is often the case that the use changes through the design process to production. 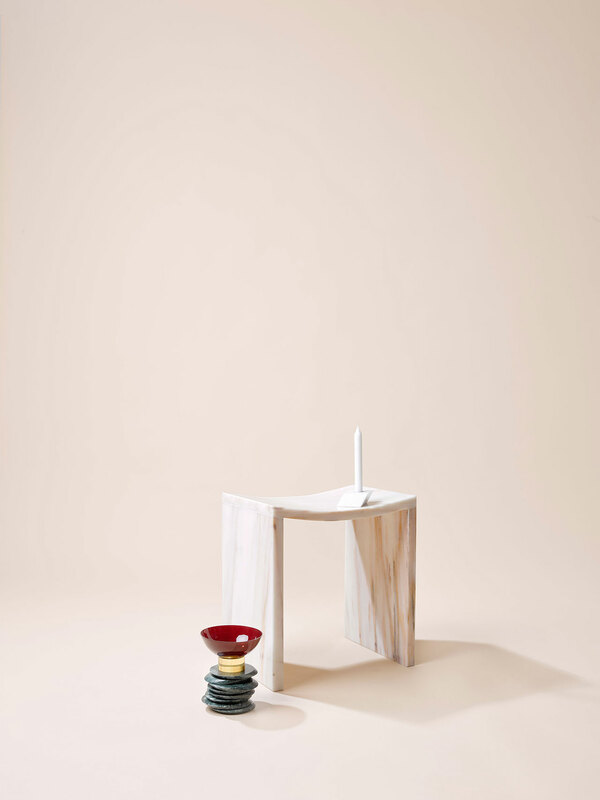 A stool can be a side table, a sculptural piece, or an abstract snapshot from a larger installation. We like working with notions of flexibility, ambiguity, illusion or de-familiarization. 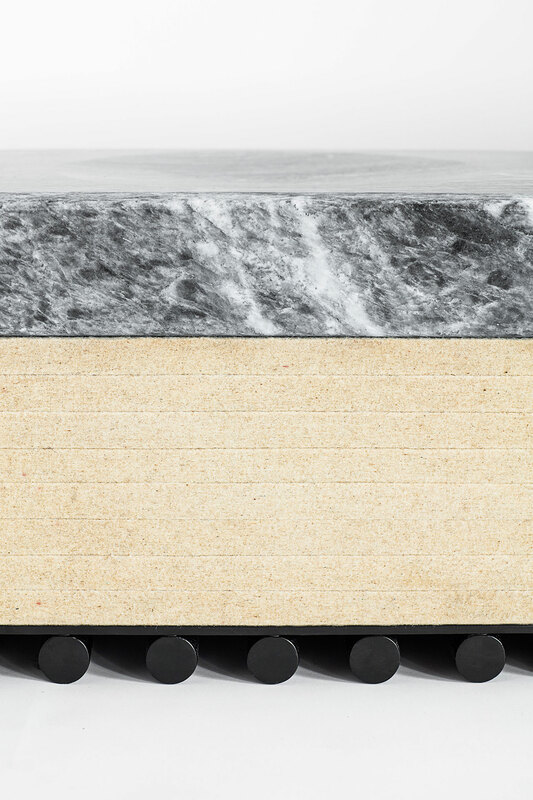 Objects of Common Interest, Layer Stool, 2016. 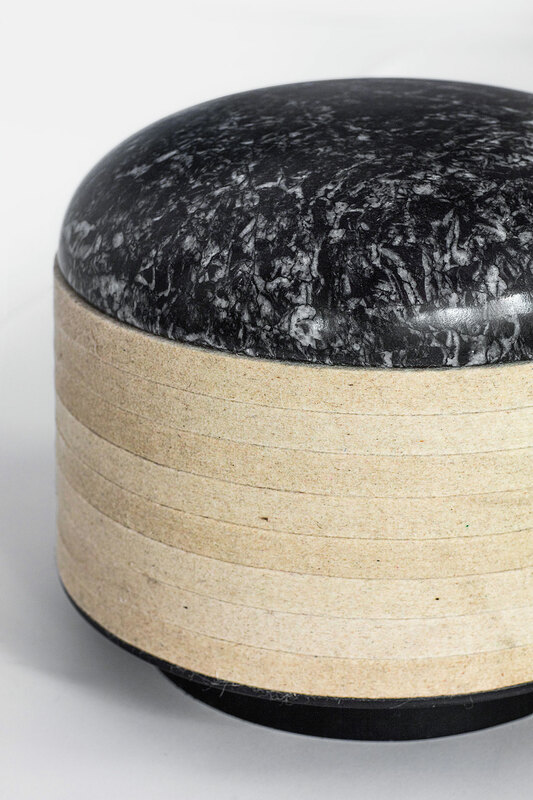 Marble, Wool Felt, Steel. Photo by Matthieu Salvaing. 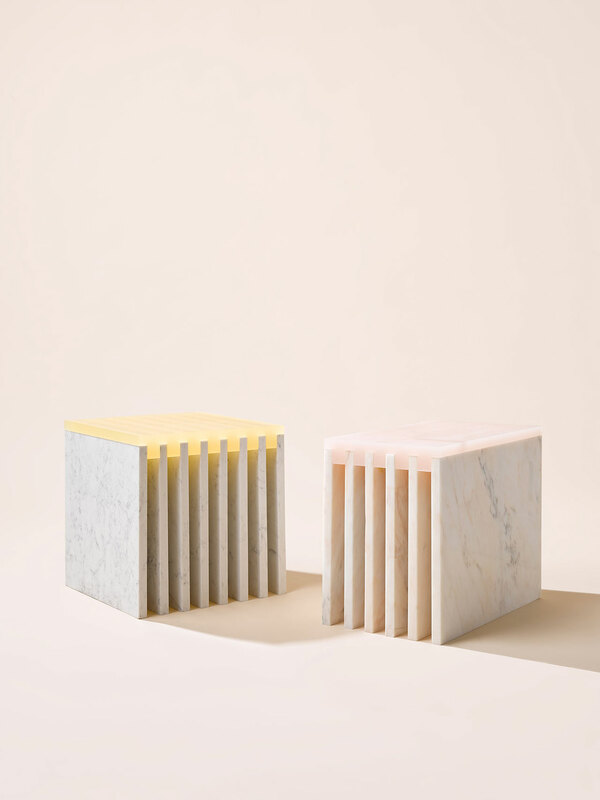 Objects of Common Interest, Layer Stools, 2016. 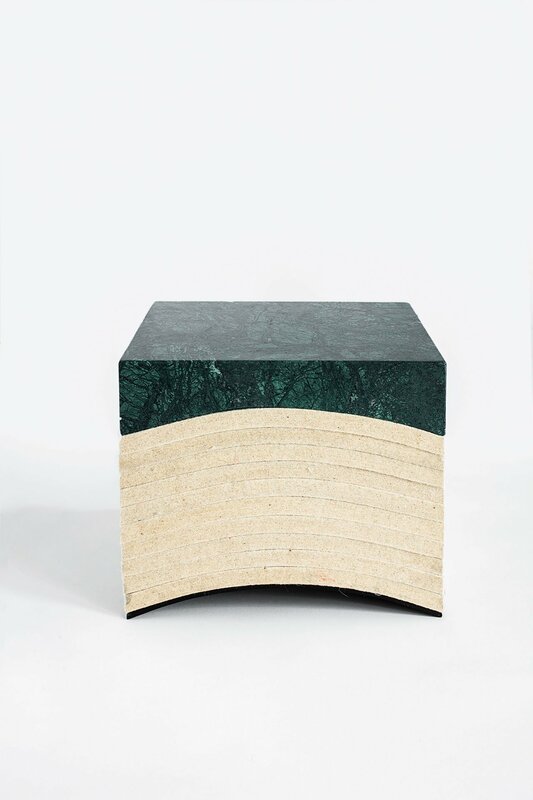 Marble, Wool Felt, Steel. Photo by Matthieu Salvaing. Where do you feel your work belongs the most? Open spaces, a home, or a museum? 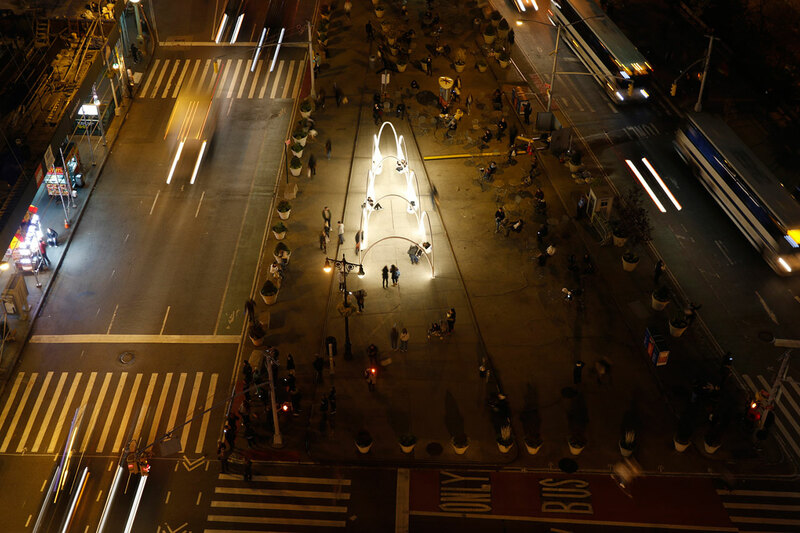 We have created work for public spaces, such as Formations for the Art Athina building entrance or Flatiron Sky-Line that was installed at the Flatiron Plaza in New York and later moved to a museum context at the Musée National des Beaux-arts du Québec. 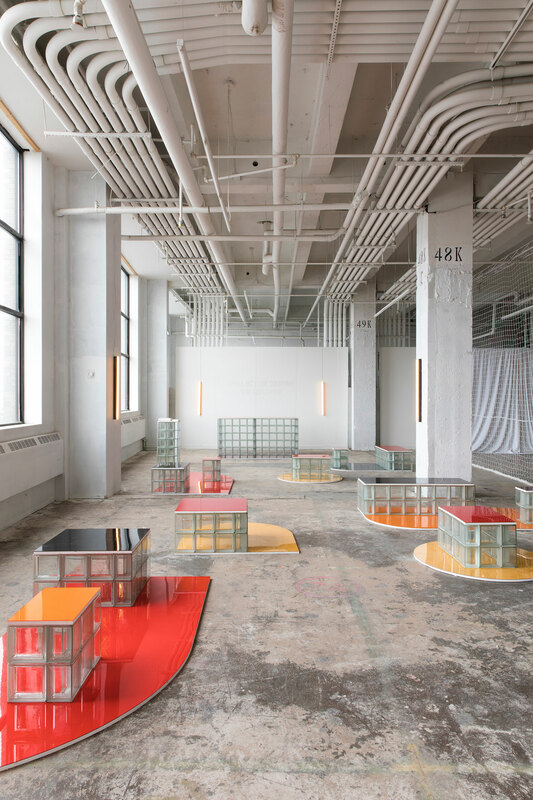 Other works are part of private collections, commissioned in collaboration with companies, such as Spectacle for Design Miami in partnership with Maharam, or live only in memory since they were temporary works, such as the glass block installation designed for the VIP lounge at the Collective Design Fair in New York. We would say that works installed in open or public spaces such as a city or a museum, where there is interaction with the public and exposure to unforeseen behaviour, is of high interest to us as it inspires new ideas for interactive projects. 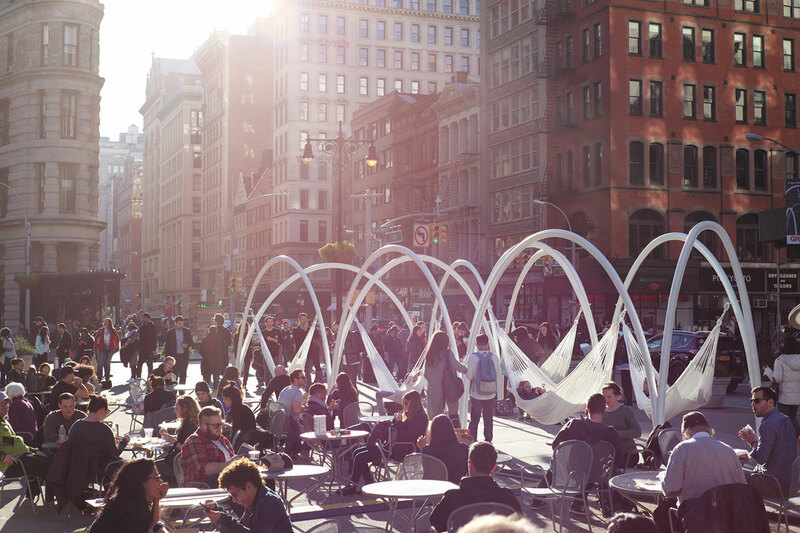 Where in the world is your favorite public space? If you could reshape one public space which one would you choose and why? The two of us have different spaces in mind, and each holds its position as a special space. It may not be our favorite design-wise, but more because of a personal connection we might have. Eleni has been talking about memories at the ‘Wasser Blitz Brunnen’ urban sculpture in Munich, for Leonidas it is the Chase Manhattan plaza in downtown NY, with Isamu Noguchi’s Sunken Garden and Jean Dubuffet's Group of Four Trees sculpture. These places have definitely been connected with special moments. Objects of Common Interest, Formations. Spatial Installation at Art Athina 2018, Athens, 21–24 June 2018. Photo by Omar Sartor. Objects of Common Interest, Spectacle. Spatial Installation at Design Talks Theater at Design Miami, 2017, Miami Beach, December 7–10 2017. In partnership with Maharam. What are you inspired by? Has your Greek heritage influenced you in any way? We are inspired by the everyday, moments of abstract beauty and randomly found things. We are inspired by art, mainly the circumstances that have allowed art forms to emerge and the stories of the artists that led them to create the art they created: minimal art, land art, surrealism… We do carry our Greek influence in all of the things we do, not just in the form of historic references or education - that would be more direct or evident, but rather as a feeling or an influence that is cultural and helps us maintain a sensitivity and an underlying identity in our work and personal life, not necessarily visible to all, but for us it is what drives us and motivates us. We have been living and working between Greece and New York for a while so we never really lost any connection with any of the two worlds. Do you believe traditional crafts still have a role to play in contemporary design? Is there one you most admire? Yes definitely, traditional crafts will always have a role to play in design no matter what new technology is being developed. In fact new technologies always draw inspiration from traditional crafts as they aim to resemble them in their outcome. We have been fortunate to be working with many craftsmen, mostly in Greece as we have been trying, since the beginning, to support and also discover new talent. 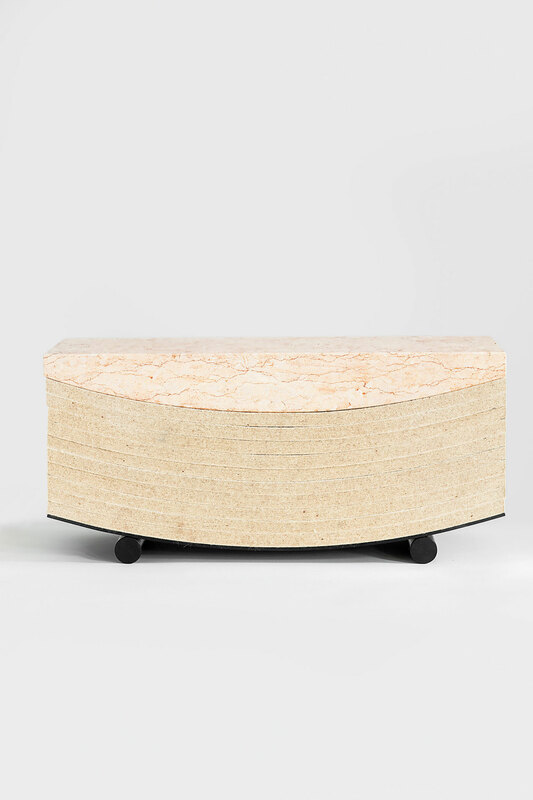 We have been inspired and learned so much working with a piece of marble, not so much in terms of the technology of the craft but from the attention and care that is given to the material by the people who work with it. Objects of Common Interest, Parallel Bench, 2016. 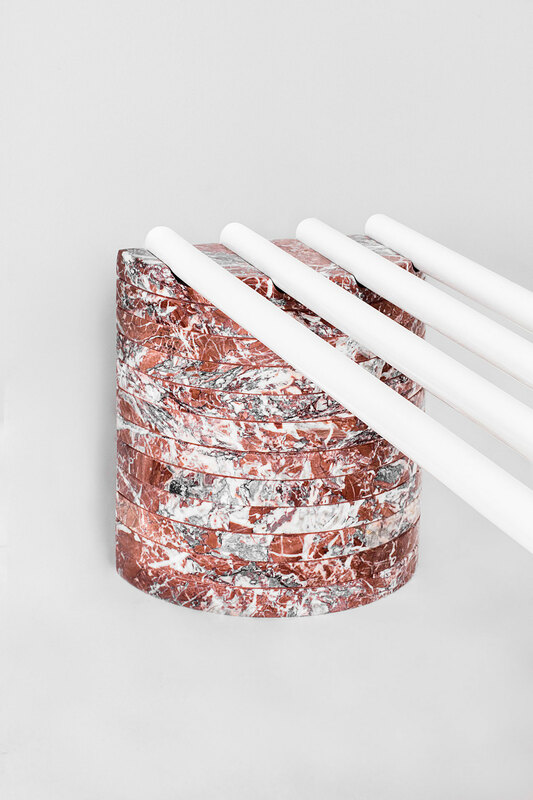 Marble, Steel Tubes. Photo by Matthieu Salvaing. Objects of Common Interest, Relativity of Color, 2017. Glassware made from Hand-blown Glass & Acrylic. Photo by Brooke Holm. Objects of Common Interest, Side Tables, 2016. Marble, Cast Acrylic. Photo by Brooke Holm. Objects of Common Interest, Side Table, 2016. Marble, Cast Acrylic. 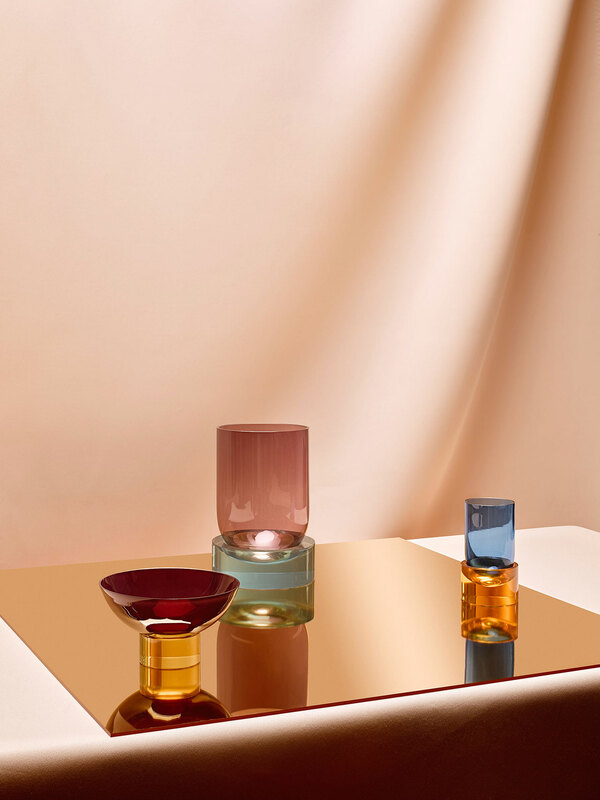 Relativity of Color glassware, 2017. Hand-blown Glass, Acrylic. Photo by Brooke Holm. How has technology influenced your work? Has it helped you achieve the supposedly impossible, and if so how? Technology is not something we base our work on, but it offers us the freedom to create, knowing that concepts we want to create will be feasible, so there are no restrictions other than a conceptual one. We have not yet flirted with the impossible. Tell us about your latest installation, Landscape, for the Collectible design fair in Brussels. This is the first time you have worked with light, why is that? This is a question we have been asked many times lately. We had been preoccupied with many different projects, from architecture to design, and didn’t have the clarity and time required to develop light fittings. 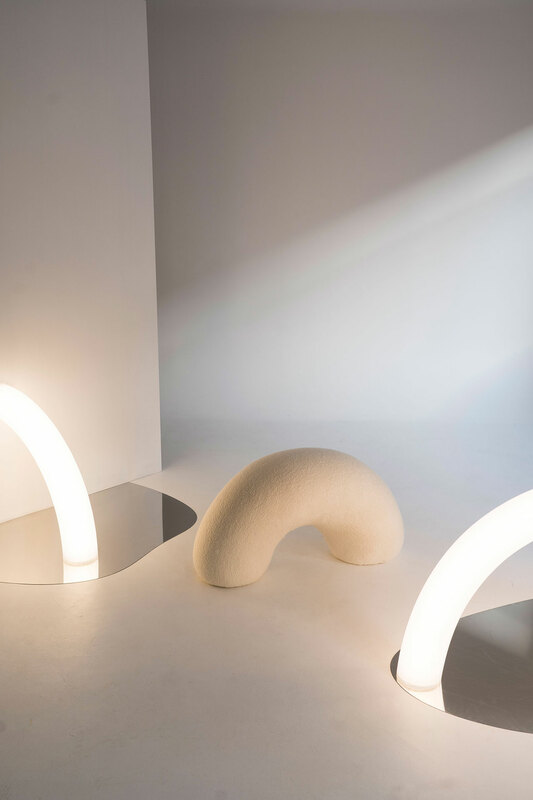 Tube Lights, our first light project, feature glowing curved formations, shapes that appear to be pliant and soft, allowing for ideas that we have used in our vocabulary – illusion, geometric clarity, simplicity and complexity etc. 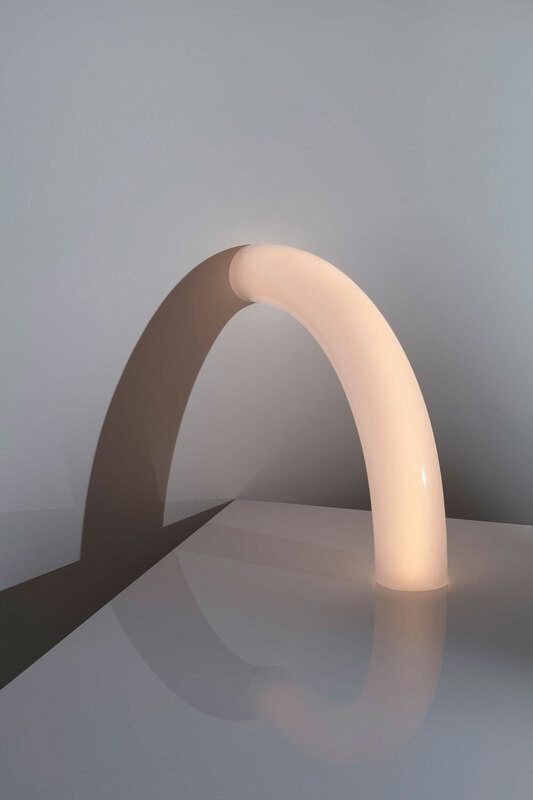 – to be applied in lighting objects that stand alone as sculptures, yet also as lights. 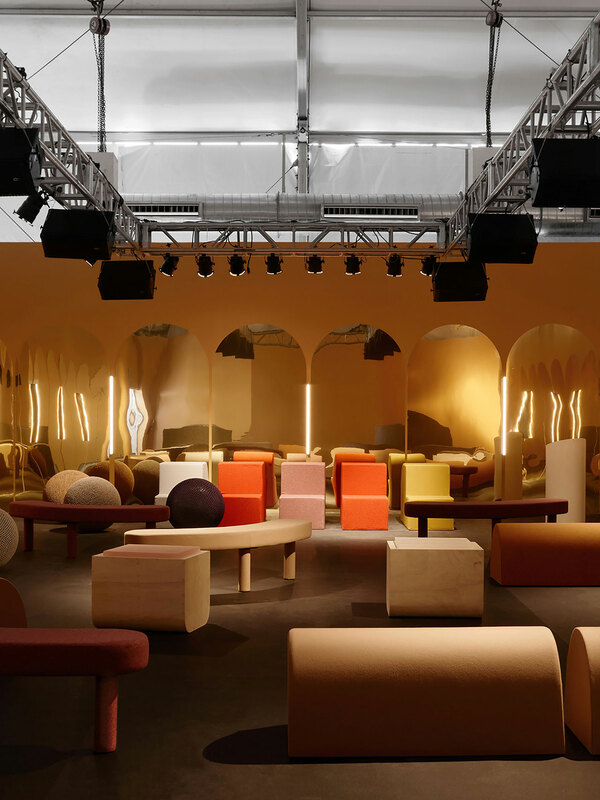 Sight Unseen, the online publication and curatorial platform from New York, invited us to take over their special project booth at Collectible, with an open brief. 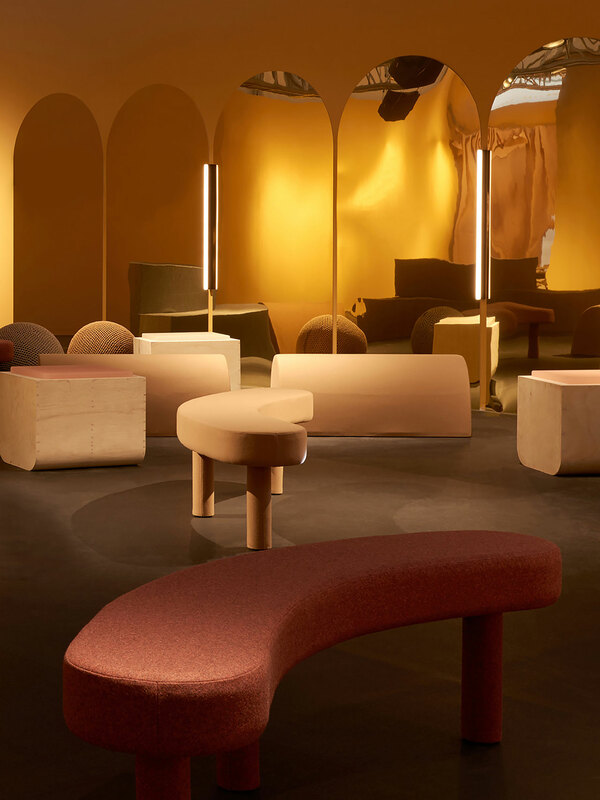 Landscape is a space installation we created by exhibiting Tube Lights together with a limited edition series of upholstered seating elements. Objects of Common Interest, Untitled. 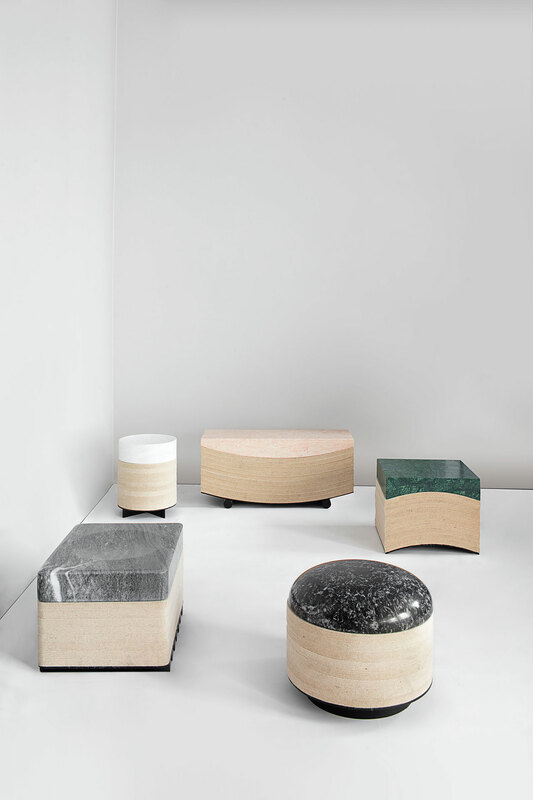 Installation at the VIP Lounge at Collective Design 2018, New York, March 8–11 2018. Photo by Clemens Kois. 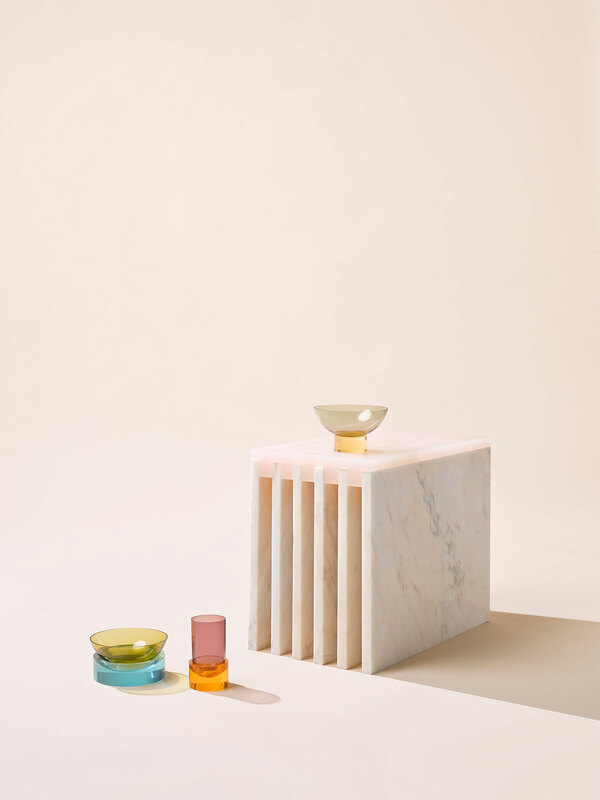 Objects of Common Interest, Landscape installation for Collectible Design Fair in Brussels, Mar 14-17, 2019. Photo by Jeroen Verrecht. Leonidas Trampoukis & Eleni Petaloti portrait. Photo by Mattheu Salvaing.